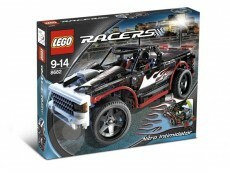 Lego 8682 Racers Nitro Intimidator | Dzunglehracek.cz - Lego a Lego Duplo stavebnice, sety pro sběratele. Naprosto vyjímečný historický set, se skvělým designem a jedinečným provedením. Tento set je zcela nový, nepoužitý má však již krabici s viditelným potřebením. Meet the Nitro Intimidator! 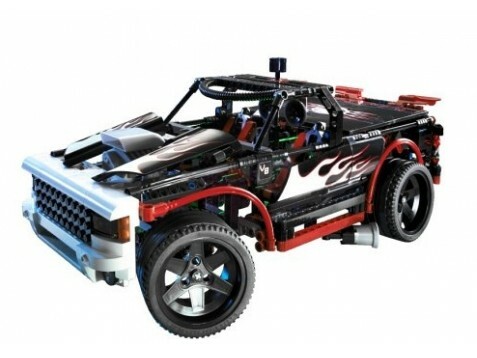 This super-charged truck has everything you'll need to make your customized statement, from a supercharged V8 engine to nitro bottles and a stereo set-up, plus a big screen and game system in the back. Scorching white flame decals, working steering and oversized exhausts keep this revved-up street machine racing ahead of the pack! 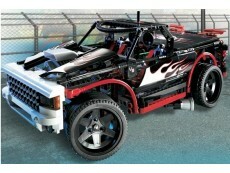 Includes decals to customize truck body! Trunk opens to reveal speakers and game system! Steering really works! 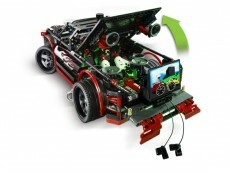 Features detailed V8 engine! Truck measures over 15" (39cm) long!